This page deals primarily with the mechanics of faction warfare. For tips on how best to take advantage of these mechanics, see Factional Warfare strategy and tactics. Faction warfare (often abbreviated as FW) is a game mechanic whereby you can sign up to fight for one of the four empire factions (against its enemy faction) for control over certain areas of low-sec space. It was first introduced in the Empyrean Age expansion (2008) to offer players a stepping-stone into PvP (player-vs-player) gameplay. Faction warfare is primarily centered around two war zones (areas of low-sec contested by two empires): the Amarr-Minmatar war zone and the Caldari-Gallente war zone, which each are located on the border of the two respective empires. In these war zones, players who participate in Factional Warfare attempt to conquer star systems for their empire, and are rewarded with loyalty points and increased faction standings for their efforts. Additionally, as players who participate in Factional Warfare are effectively at war with two of the four empire factions in the game, they can therefore attack (and be attacked by) players fighting for the enemy factions anywhere in New Eden, as well as fight the enemy NPC faction navies (who patrol the high-sec star systems belonging to their faction). There are two ways to join Factional Warfare (the game calls this "enlisting"): join as a solo player, or join as part of a player corporation or alliance. EVE University does not participate in Factional Warfare; members of the University have to leave the University to participate in Factional Warfare (or create an alt character specifically for Factional Warfare). EVE University used to have affiliated corporations which participated in Factional Warfare, but this is no longer the case. Join Factional Warfare through the Militia Office window in a station belonging to the empire you wish to fight for (in this example, the Caldari). Any player can join Factional Warfare provided that their standings towards the empire faction (e.g. the Gallente Federation or the Caldari State) they wish to fight for are 0.0 or greater. Note that only raw, unmodified standings (i.e. without taking the effects of skills like Social into account) count; you can check your standings on your character page. You can enlist at any station belonging to the empire faction you wish to fight for by opening the "Militia Office" window (from the NeoCom or the Station Services window). Note that even through the Khanid Kingdom and the Ammatar Mandate are affiliated with the Amarr Empire, they do not count as being a part of it, and therefore you cannot join Factional Warfare from their stations. Joining as a solo player happens immediately, unless you have roles in a player-run corporation (in which case it takes at least 24 hours to relinquish your roles and leave your corporation). These militia corporations have NPC agents working for them, which offer missions to pilots enlisted with their respective faction. The CEO or Director of a corporation can enlist their entire corporation (i.e. all their members) in Factional Warfare to fight for one of the four empires. As with solo players, the corporation must have a standing of 0.0 of greater towards the empire they wish to fight for (corporation standings are an average of of its all the members' individual standings, see corporation standings for more details). Enlisting a corporation takes effect after the next downtime. Players must be in a corporation flagged for Factional Warfare to participate. Therefore, it's not possible for individuals in a player-run corporation to either join Factional Warfare on their own – they have to leave their corporation, and join a different one which is operationally flagged for FW, such as the NPC ones listed above. Conversely there is no way for an individual in a FW corp to opt out – if the corporation changes their flag to join the militia, every member of that corporation automatically joins with the corp. 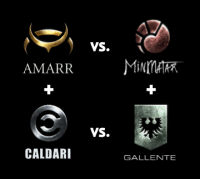 The Amarr and the Caldari fight against the Minmatar and the Gallente. Factional Warfare revolves around two conflicts, one between the Amarr and the Minmatar, and the other between the Caldari and the Gallente. 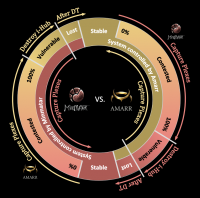 Additionally, the Amarr and the Caldari are allied (as are the Minmatar and the Gallente), which means that pilots fighting for (for instance) the Gallente can also help their Minmatar allies fight against the Amarr (with the exception of infrastructure hubs), and attack (and be attacked by) pilots fighting for the Amarr as well as the Caldari. Additionally, that same pilot would be attacked by the NPC faction navies of the Amarr and the Caldari should he enter their high-sec space. The majority of the actions in Factional Warfare take place in two areas of low-security space, each of which is contested by two empires, known as "war zones". The Amarr-Minmatar war zone extends into parts of the Devoid, Bleak Lands, Heimatar and Metropolis regions, while the Caldari-Gallente war zone extends into parts of the Black Rise, Citadel, Essence, Verge Vendor, and Placid regions. The high-security systems on the borders of the war zones are often used as staging areas (as players fighting for the enemy militia cannot enter them without being attacked by friendly NPC faction navy ships), although many player corporations also use systems inside the war zones themselves as home bases. The core Factional Warfare gameplay of capturing systems and running missions takes place exclusively within the war zones. Dotlan and Ombeve have very useful maps of the war zones. 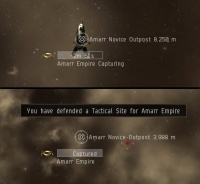 An illustration of how to capture (or defend) a star system in Factional Warfare (using a system contested by the Amarr and the Minmatar as an example). Attacking and completing complexes ("plexes") in a system to make the system vulnerable to capture. Once the system is vulnerable, attack and destroy ("capture") the system's infrastructure hub (also known as an "i-Hub") to capture the system. A system starts off as "stable" (or "uncontested"). The attacking faction (for instance, pilots flying for the Gallente attacking a Caldari-held system) must first attack and complete complexes in the system (this is known as "offensive plexing"); for each completed complex, the system becomes ever more "contested" (commonly quoted from 0% to 100%, sometimes also measured in victory points). Once a system has become 100% contested, it is listed as "vulnerable", and the attacking faction can then attack the system's infrastructure hub. Once the infrastructure hub is destroyed, the system is considered "lost" and will switch to the attacking faction's control after the next downtime (DT). During this time, the defending faction can also complete complexes in the system (this is known as "defensive plexing"); for each completed complex, the system becomes ever less "contested" (or, if it's currently "vulnerable", it will revert to being "contested"), all the way back to "stable". While a system is "vulnerable" or "lost", the attacking faction may still capture complexes, but they will not get any reward nor affect the system's capture. Additionally, once a system is "vulnerable", the defending faction needs only to capture a few complexes to revert the system to "contested" (and therefore render the infrastructure hub invulnerable again); the attacking faction only create a small "buffer" against this by capturing more complexes while the system is "vulnerable". Similarly, once the defending faction has captured enough complexes to revert a system to "stable", the attacking faction only needs to capture one complex to put the system back to "contested". Obviously, in addition to the mechanics above, pilots can (and should!) attack the other faction's pilots to stop them from completing their objectives! The layout of a complex. To enter a complex, you must first activate the complex' acceleration gate, which will warp you into the complex at its beacon. In order to capture the complex, you must stay within 30 km of the capture point. Complexes can be found via the system scanner. An overview showing typical Factional Warfare objects. Factional Warfare Complexes (commonly known as "Plexes", not to be confused with PLEX) are small areas of deadspace in war zone star systems. They are a type of Cosmic Anomaly, which means that they show up on the system scanner (but do not need scan probes to find), although once someone has warped to a complex, they will also show up on the Overview (even if someone initiated a warp to them, but cancelled it immediately). 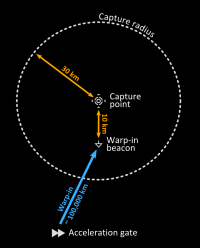 Like most other Deadspace Complexes, you cannot warp directly into them, but must first use an acceleration gate, after which you will land at the complex' beacon (large complexes (see below) do not have an acceleration gate, but you will still land at the complex' beacon when you warp in); you cannot light a cynosural field inside a complex. At the center of each complex, a few kilometers away from the beacon, is the capture point (sometimes called a "button"). An NPC ship belonging to the faction controlling the star system defends the complex. In order to capture a complex, you must first clear the area (radius: 30 km) around the capture point of enemy ships. If you're the attacking faction, this includes killing the defending NPC; if you're the defending faction, the NPC will obviously not fire on you, and you therefore you shouldn't destroy it (even if it appears as "hostile" on your overview)!. Then you must stay inside the capture radius (within 30 km of the capture point) until the complex' timer has counted down to 0 (you can see how much time is left by selecting the capture point), at which point you will have captured the complex! An Amarr pilot capturing an Amarr complex ("defensive plexing"). The timer on the capture point shows how much time is left before the complex is captured. Additional ships from your faction will not make the timer count down faster; if you leave the complex, the timer will pause (but will not reset). If an enemy ship enters the complex, the timer will also pause until ships from only one faction are present in the complex, and then it will resume counting down. 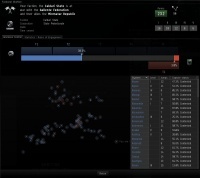 Note that the timers for both factions are additive - so if a Caldari pilot has spent three minutes capturing a complex, and is then destroyed by an incoming Gallente pilot, the Gallente pilot would have to spend an extra three minutes in the complex in order to capture it (in order to "undo the capturing" previously done by the Caldari pilot, so to speak). No ship can cloak within the capture radius of a complex. Neutral pilots (i.e. pilots who are not enlisted in a militia) can enter a complex, but cannot capture it (their presence doesn't affect the complex' timer). Pilots in a militia can capture complexes in their ally's warzone, but only on their ally's behalf (so, for example, a pilot fighting for the Minmatar could go to the Caldari-Gallente warzone and capture a complex on behalf of their ally (the Gallente)). Once a complex has been captured, it disappears from the scanner/overview and despawns after a few minutes. A new complex of the same size will spawn about 30 minutes after the previous one was captured. On average, there will be one or two complexes of each size in a system. However, if many players have been active in a system recently, it may be the case that, for a brief time, there are no complexes available to capture. Before the Kronos expansion, ships could cloak within the capture radius of complexes. This not only led plex farmers to fit cloaking devices to their ships (allowing them to cloak and escape at the first sign of danger), but also encouraged players to sit in a cloaked Stealth Bomber inside a complex (to ambush incoming ships). Complexes come in four types, often called "sizes" (which is a bit of a misnomer, as the physical dimensions of the complex are always the same). They vary in what ship classes are allowed to enter, what NPC defends them, and how long it takes to capture them. While each type of complex contributes the same amount to capturing a system (measured in victory points), capturing larger complexes result in higher rewards. Additionally, capturing complexes in enemy-held systems gives higher rewards than capturing complexes in friendly-held systems. Complexes are defended by a single NPC (in rare cases, two); it's designed to be killed without too much trouble by a player ship of similar size. Once killed, the NPC defender will respawn after between 90 and 180 seconds for novice and small complexes. In medium and large complexes, the NPC respawns after between 90 and 300 seconds. An infrastructure hub ("i-Hub") in space. The Infrastructure Hub (or "i-Hub") is a structure in space which the attacking faction needs to destroy in order to capture a system. The i-Hub can be found (and be warped to) from the Overview, but can only be damaged if the star system is in a "vulnerable" state, and then only by pilots of the attacking faction (pilots of the defending faction, pilots in an allied militia, or neutral pilots cannot damage the i-Hub). The i-Hub has 25 million hitpoints (HP), with 7.5M HP each in shield and armor, and 10M HP in structure. This means that a medium-sized fleet is needed to destroy an i-Hub in a reasonable period of time (keeping in mind that its peak shield recharge rate is around 1700 HP/s, which is the absolute minimum amount of DPS needed to break through its shields). Once the i-Hub is destroyed (technically, once it reaches 1% structure), the system will be "lost" and will switch to being occupied by the attacking faction after the next downtime. As explained above, if a system is "vulnerable", and if the defending faction can capture enough complexes, the system will revert back to "contested". The i-Hub will then become invulnerable again, and any damage which the attacking faction has so far managed to do to it is reset. Therefore, while attacking the i-Hub, the attacking faction must also prevent the defending faction from capturing complexes. The i-Hub is also the place where pilots of the defending faction can donate loyalty points to upgrade the system. Formally, how "contested" a system is is measured in how many victory points have been accumulated by the attacking faction for that system. If the attacking faction has not yet accumulated any victory points for that system, then the system is "stable", and if they then capture a complex (regardless of its size) they are rewarded with 20 victory points (conversely, if the defending faction captures a complex, 20 victory points are subtracted). In order to bring a system to "vulnerable", the attacking faction must accumulate 3000 victory points (i.e. capture 150 complexes more than the defending faction). Once a system is vulnerable, the attacking faction can continue capturing complexes until they have a "buffer" of 100 victory points; this is to give themselves some breathing room while they attack the i-Hub. A system can be upgraded by donating loyalty points (LP) at the system's infrastructure hub. This system is currently at Level 3, nearing Level 4. When you donate LP, a part is lost as a "maintenance tax" (for example, if you donate 1000 LP, and the maintenance tax is 5%, then only 950 LP are actually counted towards upgrading the system). The maintenance tax starts at 0% and increases the higher their faction's tier is, up to about 75%. The LP you donate is put into a pool with the LP donated by other players from your faction in that system, and the size of that pool determines the system's upgrade level. A system can be upgraded up to level 5. In the screenshot on the right, Caldari militia members have donated a total of 129,360 LP in that system, which equates to an upgrade level of 3. In order to each level 4, they would have to donate an additional 10,640 LP to bring the total to at least 140,000 LP. You can check the current upgrade level of a system (along with the associated benefits) through the system information display at the top-left of the screen. Here you can see who currently controls the system, the system state (stable / contested / vulnerable / lost) and its upgrade level. Beyond providing benefits for the system itself, upgrading star systems also contributes to the overall tier of the war zone, which can bring additional benefits. The amount of LP in a system's pool is reduced every time a player from the attacking faction captures a complex in that system; 10% of the LP reward they receive is subtracted from the system's LP pool. A Gallente pilot captures a novice complex in a Caldari-held system. The Gallente pilot is rewarded (say) 10,000 LP for her efforts, and hence, the Caldari LP pool for that system is reduced by 10% of that (1,000 LP in this case). If the amount of LP in the pool drops below the threshold required for the current system level, then the system's upgrade level will drop accordingly. 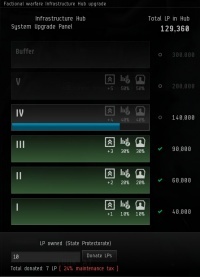 The defending faction can counteract this by donating more LP to the pool; even if the system is at level 5, they can continue donating LP into a so-called "buffer" (i.e. more LP than is needed to reach level 5) to stop the system dropping to level 4 as soon as one enemy pilot captures a complex. If a system is captured by the attacking faction, then all the upgrades are lost and the system reverts to its base (i.e. "un-upgraded") state. The state of the Caldari-Gallente war zone in December 2013, as seen from a Caldari station. 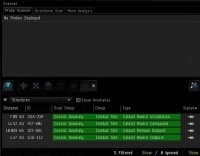 This window shows the number of systems controlled by the Caldari, their upgrade levels, and the resulting tier. The more systems in a war zone a faction controls and the more those systems are upgraded, the higher the rewards the pilots who fight for that faction receive. This is represented by the "faction tier" mechanic: each faction receives a point for each system they control in their war zone, plus an additional point for every system level upgrade (so an un-upgraded system is worth 1 point, a system upgraded to level 1 is worth 2 points, a system upgraded to level 2 is worth 3 points, a system upgraded to level 3 is worth 4 points, and so forth). The number of points a faction has is then compared to the total number of available points in a war zone (which is equal to the number of systems in the war zone multiplied by 6 (as a system can be upgraded up to level 5, and a level 5 system is worth 6 points)). The main effect of faction tier is that it affects how many loyalty points you receive for various activities you do in Factional Warfare; the higher your faction's tier, the higher your rewards. For example, the base reward for capturing a novice complex in an enemy-held system is 10,000 LP. If your faction is at Tier 1, then you will only receive 5000 LP, while if your faction was at Tier 4, you would receive 25,000 LP for capturing that same complex! This bonus affects all activities which reward Factional Warfare LP, notably capturing complexes and running missions. If you open the militia window in a station then you can see the tier of that faction's war zone (so the militia office at a Minmatar station would show the tiers in the Amarr-Minmatar war zone), as well as the number of systems (and their upgrade levels) currently controlled by that faction. Dotlan also shows the system occupancy and the system state (stable/contested/vulnerable), but not the system upgrade level or the faction tier. Each of the four Factional Warfare NPC corporations ("militias") have a number of agents which offer missions to pilots enlisted with their militia (and their allied militia). These missions are similar to the encounter missions offered by agents of Empire corporations, but they are run exclusively in the war zones (although they do not contribute to capturing or defending star systems in those war zones). You are rewarded with ISK and loyalty points (LP) for completing these missions. While the primary reason for Factional Warfare is to encourage PvP in low-sec, players are also rewarded directly for participating in the Factional Warfare mechanics. If you capture a complex you are rewarded with loyalty points (for your faction's militia corporation, so a pilot flying for the Gallente would receive LP for the Federal Defense Union). The LP rewards for capturing a complex in an enemy-held system ("offensive plexing") depend on the size of the complex and on your faction's tier. You have to be within the complex' capture radius at the moment it's completed (i.e. when the timer runs out) to receive a reward; if there are multiple pilots within the complex at the moment it's completed, the LP reward is split evenly between them (irrespective of how long they have been there). You get no rewards for partially completing a complex! The LP rewards for capturing a complex in a friendly-held system. This example is based on a novice complex at tier 2 (base reward: 10,000 LP). This means capturing a complex in a friendly-held system will pay out, at most, 75% as much as capturing an equivalent complex in an enemy-held system, and the closer the system is to "stable", the lower the reward. The base reward for destroying an infrastructure hub ("i-Hub") is 40,000 LP, split between all the pilots who damaged the i-Hub. Missions in Factional Warfare, just like missions anywhere else in Eve, pay in both ISK and loyalty points (LP). The rewards from these missions depend on both the mission level (i.e. their difficulty) and the security rating of the system where the agent is located (the lower the security rating, the higher the rewards). Any levels of the Negotiation and Security Connections skills you have trained increase the ISK and LP rewards, respectively. In addition (just like with capturing complexes), the LP rewards are also affected by your faction's tier (so if a mission normally pays, say 1000 LP, but your faction is at tier 3, you would receive 1000 + 75% = 1750 LP). Since these different bonuses stack, the LP rewards from high-level missions (when combined with a high faction tier and a few levels of the Security Connections skill) can be very high indeed. Note that, unlike missions in Empire space, the NPC enemies you kill in Factional Warfare missions do not have bounties on them and drop very little loot (other than Navy tags, which can be sold or used to buy items in the LP store). As with capturing complexes, if several pilots are involved in killing a ship, the reward is shared equally between them. The LP reward scales with faction tier, but is capped at 50,000 LP per kill. As with all corporations which reward loyalty points (LP), the four faction militia corporations each have a LP store where you can buy implants, modules, ships, blueprints and skillbooks with the LP you have earned. These stores stock a similar range of items to their respective faction navies' LP stores, but at a discount (for example, the Apocalypse Navy Issue costs 600,000 LP from the Amarr Navy LP store, but only 250,000 LP from the 24th Imperial Crusade LP store). Before the Inferno expansion, the faction tier directly reduced prices in each militia's LP store (so an item would be cheaper the higher the faction tier). This led to a massive see-saw as the factions earned their LP at lower tiers, then made a massive push to tier 5, cashed out all their LP into items (promptly crashing the markets for those items), before letting their tier drop again. Participating in Factional Warfare can impact your standings towards, notably, the militia corporations and the empire factions. High standings towards your faction militia corporation not only grants you access to higher-level mission agents, but also awards you "ranks" (which are visible on the "decorations" tab in your character sheet). You are promoted to a higher rank every time your standings reach an integer number (i.e. 1.0, 2.0, 3.0 - unmodified); when you are promoted, you also receive a one-off bonus to your standings with your faction. Otherwise, your rank is purely cosmetic. The first of these is similar to being a member of a player-run corporation which is at war with another player-run corporation. You can attack pilots who are enlisted in the enemy militia anywhere in New Eden (CONCORD or sentry guns will not interfere) without impacting your security status (and, of course, they can also attack you!). This effect is most felt in high-sec, where you now have to be on the lookout for enemy players. The second of these restricts your movement through high-sec systems controlled by the two enemy factions. If you enter one of these systems, you will get a text warning on your screen; if you don't leave the system promptly, you will be attacked by NPC faction navy ships. These ships are more powerful the higher the security rating of the system you are in, and will use electronic warfare against you (such as neuts/nos and webs). However, unlike CONCORD, they will not scram or warp disrupt you, so you can run away from them (therefore, also unlike CONCORD, it's certainly feasible to survive encounters with them - but they make travel through enemy-held high-sec a hassle at the least). The in-game star map (or a third-party site like Dotlan) can help you to plan safe routes. Additionally, you cannot dock in stations controlled by the enemy NPC factions in the war zones (but you can dock at enemy NPC stations in all other parts of space). This means that if you have items or ships in a station which is now held by the enemy faction you cannot access them until your faction takes the system back (although, in a pinch, you can create a contract to a neutral player, alt, or hauling service to get your items out). You can leave Factional Warfare at any time through the Militia window if you joined as a solo player (or, for an entire corporation, the CEO or Director can do this). You will keep any loyalty points you have earned, but will no longer be able to participate in the formal Factional Warfare mechanics (capturing complexes and systems, or running missions). Additionally, you can re-enlist at any time (provided you meet the criteria). If at any point your (unmodified, i.e. without taking skills into account) standings towards your faction drop below 0.0, you will receive a warning mail to raise them back up at the next downtime. If you have not recovered your standings until the downtime after that (i.e. two downtimes after the standing drop), you will be instantly kicked out of the FW militia. The same rules apply for corporation who join FW, except that in that case it's the corporation's faction standings which counts. This page was last modified on 11 October 2018, at 07:53. This page has been accessed 555,265 times.